There's no doubt about it; having a nice white smile can enhance both your confidence and appearance. At Hampshire Dentists, we provide a tray based teeth whitening system as we believe it lasts a lot longer than other laser based options and is much cheaper in the long run too. Rest assured it's also a pain free way to whiten your teeth! Whiter teeth in less than an hour! If you have an important event and need immediate results then this is a great option. Whether it’s a wedding, job interview or even a first date, we can help you make a great impression. The simple procedure involves placing a protective layer around the gums, leaving the teeth isolated to apply the whitening gel which contains a strong peroxide which creates oxygen bubbles which breaks up stains and discoloration deep within the teeth. Most people find this process relaxing and we encourage listening to your favourite music or watching a DVD over the hour-long process. 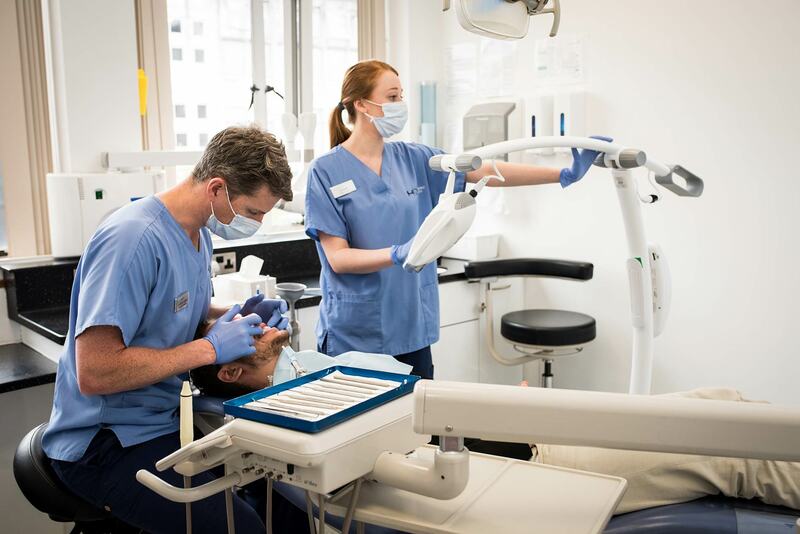 This procedure involves taking moulds of your teeth so we can custom make whitening trays to neatly fit around the contour of each tooth whilst carefully avoiding contact with your gums! They are made out of soft vinyl rubber and can be worn in the comfort of your own home made trays which fit your teeth exactly. The whitening gel which is a much weaker peroxide is applied to the trays and carefully placed over the teeth for a 2 hour period and repeated for up to 2 weeks. The end result is identical but the key advantage of the home whitening is that you will still have the trays to re-whiten the teeth in the future. We generally advocate this as the whitening process of choice due to its simplicity and weaker peroxide strength. Occasionally the stronger peroxides can make the teeth more sensitive temporarily, especially if you already have sensitive teeth beforehand. For optimum results, we generally recommend having a hygiene session before you start teeth whitening. This is to help ensure the surface is clean and the gel can properly work its magic. Once this is done, we’ll take impressions/moulds of both your top and bottom teeth. This takes approximately 20 minutes for you in the chair and a week for the impressions to be made by our lab. When your trays are ready, we’ll show you exactly what to do and give you a comprehensive (but straight forward) set of instructions. This will show you how much teeth whitening gel you need and talk you through how you can achieve the result you’re aiming for. For the next couple of weeks, you can then start whitening. Simply brush, floss, then pop in your trays. You’ll gradually see your teeth getting whiter and whiter. Rest assured, we’ll always be at the end of the phone if you have any questions. Finally, the dentist will conduct the last consultation to make sure that the treatment has been effective. Power whitening £495, which includes the home whitening top up trays. The cost of teeth whitening is really in the making of the trays, so once you have the trays, the cost of maintaining your pearly whites in years to come could be as little as £10 a year, (the cost of any future gel you might want). Generally, we find once patients whiten their teeth, they only occasionally wish to top up (e.g. once a year, every couple of years). Why Have Your Teeth Whitened with Hampshire Dentist in Southampton? Our Principal Dentist Dr Robin Hanna is experienced in teeth whitening and has undertaken a year long course in Clinical Excellence. Dr Hanna maximises success rates by ensuring that the mouth is free of disease prior to placing implants. He uses meticulous techniques and scientifically proven materials to reduce the risk of contamination and infection. Extensive and genuine aftercare treatment is provided by the Hampshire Dentists team.